Day 241: Paying It Forward . . .
It’s Monday. The start of another work week, and we both agreed that if it were Friday, we’d be very happy campers! Here in our neck of the woods, a late afternoon/early evening series of thunderstorms brought much needed rainfall to the area. Over the past dozen years of living in south and central Texas, we’ve come to appreciate rainfall. Like a lot of Texas, if you don’t like the weather, wait five minutes, it’ll change! Truer words have never been spoken. . .the only problem is that for the last three to four years–and not five minutes–it hasn’t been changing. So, to get the afternoon thunderstorm that popped up out of no where is reminiscent of years gone by in Houston when you could set your watch to pop up afternoon thunderstorms. Following up on Jean’s exceptionally successful Catholic Schools dinner back in January, she and the team are on the road making check presentations BACK to the schools! What a concept! Bringing people in to celebrate something as special as a Catholic education, and turning around and paying them to keep focusing on the mission! Hearing stories of young boys and girls who’ve found their niche as a result of the foundation given them through Catholic schools–it’s something you can’t bottle up, you can’t imitate, you can’t fake and you can’t believe how awesome it really is! Brian has been focused on being a small part of promoting the San Marcos C.I.S.D. bond election. Yes, we know that we live in a conservative world–although you’d never know it coming from the nation’s capital–but schools here haven’t had the easiest time rising to the top. Under the leadership of their superintendent who started a couple of months after Brian started at the San Marcos chamber, the district is on the verge of turning a corner towards greatness. Yes, our community is challenged with an underprivileged population, BUT there are so many people who see incredible potential here. . . educators, parents, business leaders, elected officials. . .even the students themselves. No one likes to take on debt, but there are times (like buying a house instead of renting) when taking on debt makes sense. We’re at the point when it makes sense. ‘Paying it forward’ means something different to many people. In the world of Education, it means making a difference today so it can make a REAL difference tomorrow. ‘Paying it forward’ acknowledges that what’s happening today–while significant–could pale in comparison to tomorrow if we do the RIGHT things! And, it’s funny that whether we’re talking about a private school environment or a public school environment, we’re always thinking about the future with a nod to the past and our feet firmly established in the present. Ultimately, we know that their are sacrifices that have to be made. It’s just a part of who we are. . .it’s a part of who our parents were when they made decisions in the past, and who our grand parents were when they made decisions that laid a foundation for where we are today. Overly dramatic? Perhaps, but in our ever changing global economy, we sometimes forget that paying it forward has been going on for generations. . .keeping it going forward, is, well, it’s up to our generations! 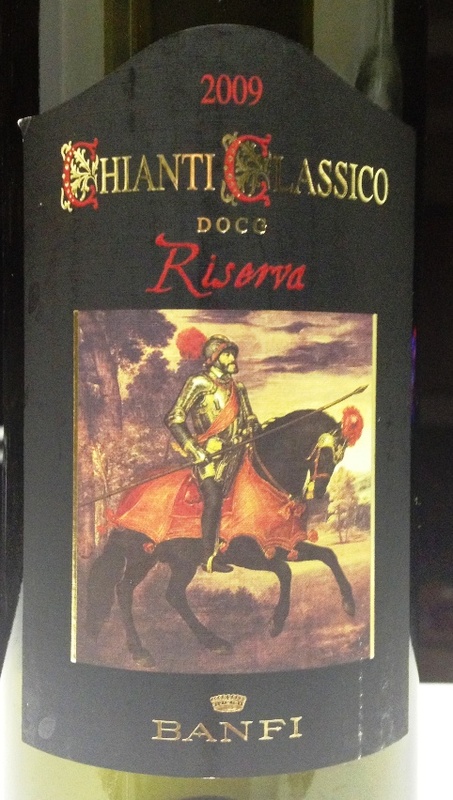 Tonight we opened a really nice 2009 Chianti Classico from the Italian wine maker, Banfi. This is an amazing wine for the money. Rated between 88-90 points, the ruby red color is mesmerizing…it’s so gorgeous and clear that we could hardly believe that we were tasting a chianti! The bouquet is intense with varietal notes of cherry, plum and violet. The taste is fresh, balanced and what we had hoped for from a Banfi Chianti Classico. Priced under $17 a bottle, you’ll find yourself looking for multiple bottles of this wine just because of the value; however, we liked it for the food! As we tasted this Italian wine, we enjoyed with Chinese food, and oh how it worked so well together. When you have a good wine and pair it with good food, it really doesn’t matter where it’s from or when it was vinted–it means that they were meant to be together!! This is a really nice wine from the Tuscany region–would sure like to go there sometime–and with a price point based on value, we’d recommend this wine for family AND friends. We really like when it rains. . .even if it means a little less sleep because of restless dogs. We really appreciate the teachers, parents and students that make up the Catholic schools in this area. . .they are committed to educating kids in a disciplined, faith-filled environment. We seek the best for our public schools–even during challenging economic times–to rise above the chatter of rhetoric and become the beacon that has made this country the best on earth. Education–paying it forward was NEVER more important. As you try your favorite wine, please enjoy it responsibly and remember to recycle whenever possible.